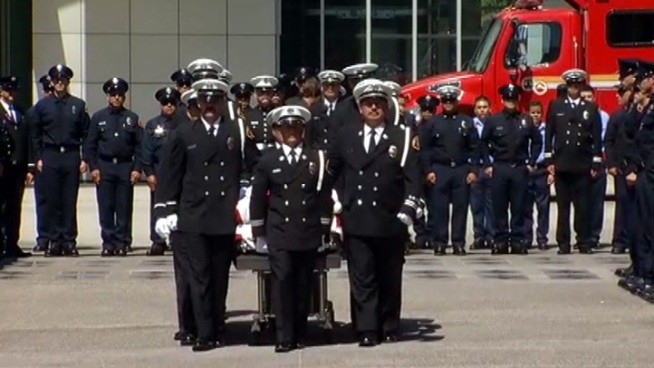 Kevin Woyjeck, the 21-year-old son of Los Angeles County Fire Capt. Joe Woyjeck, and 18 hotshots team members died June 30 when they were over-run by the Yarnell Hills fire northwest of Phoenix. Hotshots crew member Brendan McDonough, the lone survivor of the firefight, was at Tuesday's service at Christ Cathedral in Garden Grove. "Each of us has a script when we're born," said Osby. "Kevin Woyjeck's script brought us here. "We were supposed to do a lot of things together," said Maddy. "He was an amazing person on the inside and out. Everybody fell in love with that kid because he was just so fun to be around. "He was my best friend," said Bobby Woyjeck.